Over the last decade the Central Florida area has grown rapidly, and continues to grow, showing a promising expansion during its economic boom. With Kissimmee quickly becoming one of the larger cities in the area new communities and neighborhoods are opening up, town homes, homes and vacations homes are now in abundance! However if your looking for a home in the area finding one that suits your needs and wants can be a tedious task to take on alone. However, lucky for you we can help you make that decision by offering you information about the great neighborhood of Terra Verde and the surrounding area. 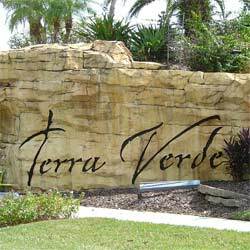 Terra Verde is located just off U.S. 192, just a short distance from the center of Kissimmee. It is not close enough that you have to deal with the rush of the city, but just close enough that you can get into town in just a few minutes. With stores like the Home Depot, Wal-Mart and a wide variety of grocery stores around the area where Terra Verde meets U.S. 192 all the necessities you need are just a short drive away! If you’re looking for a vacation home in the area you have probably already visited, and know that the Central Florida area is full of entertainment and attractions. The massive growth in the area can primarily be attributed to Walt Disney when he announced the opening of the Walt Disney World Resort in 1965. Now just seven miles from the entrance to the theme parks you can find this great neighborhood, the Terra Verde Resort. Inside the Walt Disney World Resort there are four separate theme parks, the Magic Kingdom, Hollywood Studios, Animal Kingdom and Epcot, as well as two water parks; Blizzard Beach and Typhoon Lagoon. Just a little bit farther into Orlando you can find the infamous Universal Resort, home to Universal Studios, Islands of Adventure and the connecting zone City Walk. Another popular theme park in the area is Sea World Orlando and its neighboring sister park Discovery Cove, where you can swim with the dolphins. These great theme parks and attractions are what make Central Florida so great, and living nearby means you have access to them throughout the year! Because Terra Verde is located on the edge of Kissimmee just minutes from Orlando you can find a wide variety of great local attractions just nearby. A popular place to visit during the week is Old Town located on the edge of Kissimmee. Here you can find a unique array of small shopping centers as well as carnival rides and weekly events. If you’re looking to enjoy the natural side of Florida head on over to Gatorland and see hundreds of alligators firsthand, even feed them! Or take a short drive over to Lake Tohopekaliga and take an airboat ride and see these awesome animals in their natural habitats! 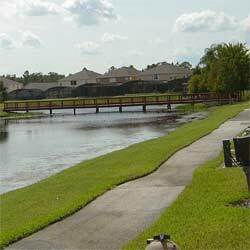 This beautiful development is constructed around a beautiful lake. In fact many of the homes have lake front properties that border the water. People who lived in the area before the construction of the Terra Verde community will tell you that the lake is teaming with fish, so if you decide to stay in one of these vacation homes be sure to bring your rod and real. There are four separate lakes in the community, all separate shapes and sizes. 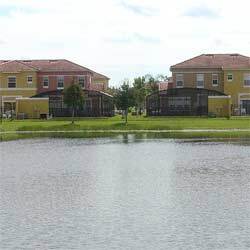 The beautiful town homes that surround this lakes have an interesting design that lets the outside properties have full sized screened in pools. The center properties in these town homes have hot tubs. All the pools face the lake, offering you a great deal of privacy as well as a fantastic view! This large community features an array of houses in all shapes and sizes. Once you pass the abundant town homes in the front of the community you will pass over a bridge into the actual neighborhood. Here you can find a wide variety of houses, all with their own unique look and feel. So whether you are looking for a town home, a condo or a place to live permanently you have come to the right place. The large clubhouse will quickly come into view after you pass the gatehouse. It’s important to note that the gate is watched twenty four seven, meaning you can relax comfortably in your home all the time. 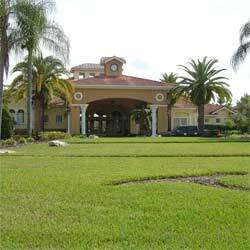 The large clubhouse features a large pool facing the first of the four lakes, as well as a large wooden deck/dock that hangs out over the water, a perfect place to relax and enjoy the Florida sun. Inside the large club house you can find an exercise center as well as an event room, perfect for any day of the year.